Functions in Swift are flexible are powerful, as they behave like a bridge between the C style functions with or without parameters, along with a return type and complex Objective C functions which maintain high level of readability with parameter names embedded* in the functions names. Here is short tutorial giving an quick introduction to the functions in Swift. The simple function above counts the multiples of the first parameter in the array of integers, which is the second parameter. We could write a function with no parameters by omitting the parameters and leaving the parenthesis empty, and a function with no (or void) return type by omitting the arrow and Int keyword. But that’s not all. We can make a function return multiple values too. Let's consider the following example. Notice the use of parameter names to make the function call more readable and intuitive. To achieve the same level of clarity while calling Swift functions, we can use external names. Now, let's check out the same function with external parameters. But thinking of two names for each parameter might be tough sometimes, and sometimes not really useful, in which case w should simply precede the parameter names in the function definition with # symbol. A parameter name preceded with hash symbols, e.g. #ofNumber can be used both as external parameter (label in the function call) and internal parameter, i.e. Inside the function. Important: External parameter names play a role in resolving ambiguity in overloaded functions. We can have a function with same parameter and return type declared again if the external parameter name is different. 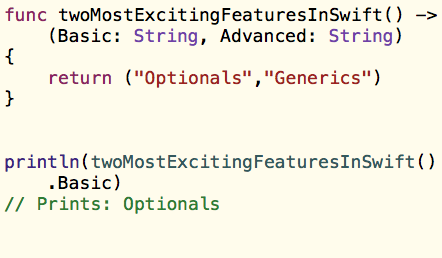 PS: The image below shows a function which prints the names of the most exciting features (one basic and one advanced) of Swift IMHO. What will your version of this function be? Please do let me know in comments. Another Swift basics tutorial on iOS Scholar's Blog, where we discuss Tuples - an advanced data type in Swift and using Tuples in Switch statement, a combination which has some powerful pattern matching potential. In this second tutorial of Functions in Swift on iOS Scholar's Blog, we discuss shorthand for External Parameters, Default parameters, their implicit external parameter behaviour, Variable parameters to modify values of otherwise immutable function parameters and Inout Parameters to reflect the changes made to parameter values back in calling scope. Swift, Apple's new programming language has a for loop construct, the for..in loop. Check out the syntax complete with examples and explanation.